Saturn SR9956-2-B, 33 1/3 rpm, 1965. He's been called the most controversial and unorthodox of all jazz musicians. A tall order, considering those who choose to play America's most innovative form of popular music tend to be anything but shrinking violets or Average Joes. 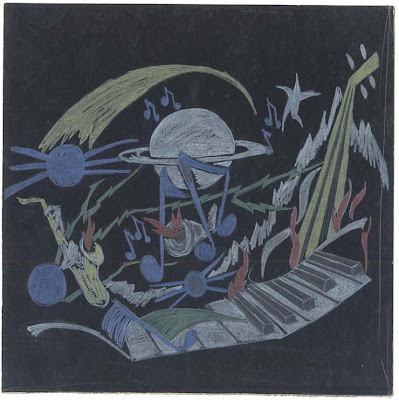 But a new online exhibit from The University of Chicago's Joseph Regenstein Library makes it clear that the man born Herman Poole Blount--but who rechristened himself Sun Ra--chose to spend his life and career far beyond even the outer limits of the jazz universe. Sounds from Tomorrow’s World explores Sun Ra’s time in Chicago, and is based on just a small portion of the Alton Abraham Papers of Sun Ra, located in the Special Collections Research Center of the university library. These papers are part of that institution's larger Chicago Jazz Archive. 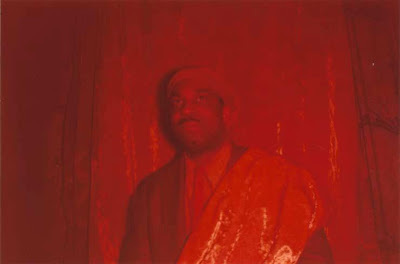 Portrait of Herman Sonny Blount, undated. Portrait of Sun Ra, undated. Sun Ra's work in Chicago is less well known and documented than his later, higher profile career in New York and Philadelphia. But many jazz historians and critics believe that some of his best music--and certainly his most accessible recordings--were produced early on in the Windy City. His music during this time was much more conventionally arranged than his later work, and was heavily influenced by the swing jazz of Duke Ellington and Count Basie. There were already hints, however, of the more exotic, eccentric, and experimental work that was to follow. Saturn LP 5786, 33 1/3 rpm, 1959. 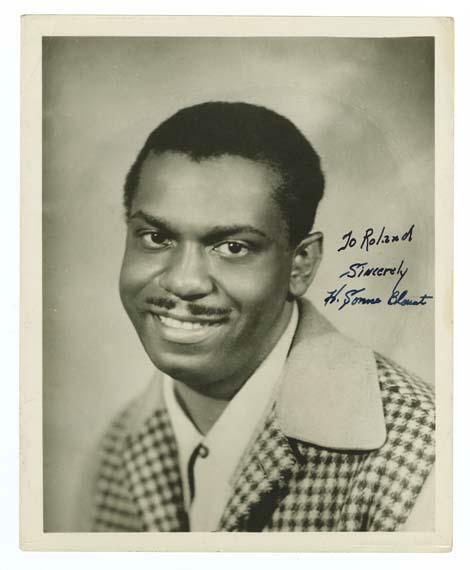 According to the exhibit, "Sonny Blount first worked as an arranger, writing for swing band leaders like Red Saunders and Fletcher Henderson, and sometimes sitting in on piano at club gigs. 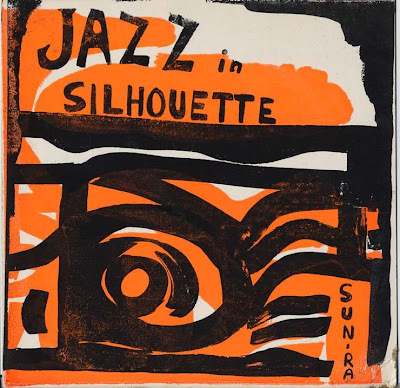 In 1952 he began billing himself as Sun Ra, and by 1954 he had begun rehearsing with his own big band, an eight man group that would become his Arkestra. Sun Ra and His Arkestra began playing at Chicago clubs such as Kirk’s Grand Terrace, the Vincennes Lounge, Parkway Ballroom and Budland. By 1956, the Arkestra had released its first LP." From the mid-1950s to his death, Sun Ra led "The Arkestra." A deliberate riff on orchestra, the ensemble had both an ever-changing lineup, and an ever-changing name. It was by turns called "The Solar Myth Arkestra", "His Cosmo Discipline Arkestra", the "Blue Universe Arkestra", "The Jet Set Omniverse Arkestra", and on and on. Sun Ra believed that as his music always changed, so should his musicians, and the name they worked under. 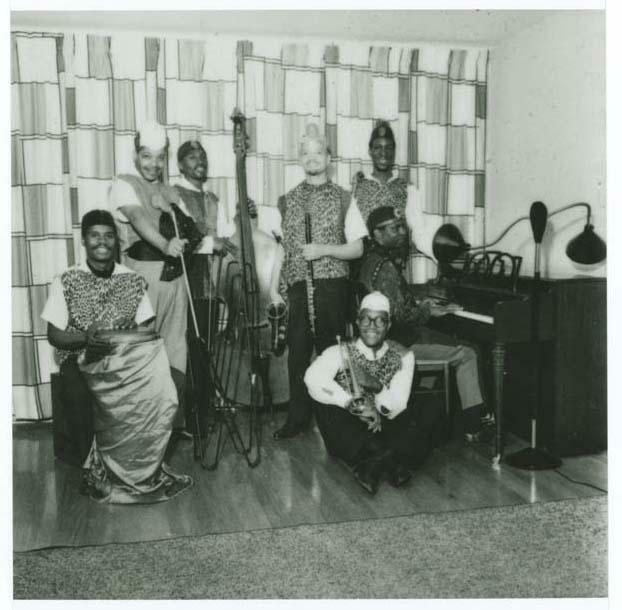 Sun Ra and his Arkestra, c.1960. As the exhibit points out, Sun Ra was a writer as well as a musician. "As he was writing and performing his music, Sun Ra was also writing poetry and prose, exploring the occult, producing music for vocal and doo-wop groups, and founding a secret society and a record label—all the while preaching sermons to passersby in Washington Park." In later years, Ra and the Arkestra traveled several times to California. In 1971, Ra taught a course at Berkeley called "The Black Man in the Cosmos." The reading list included the Egyptian Book of the Dead, the Bible, and books on hieroglyphics. 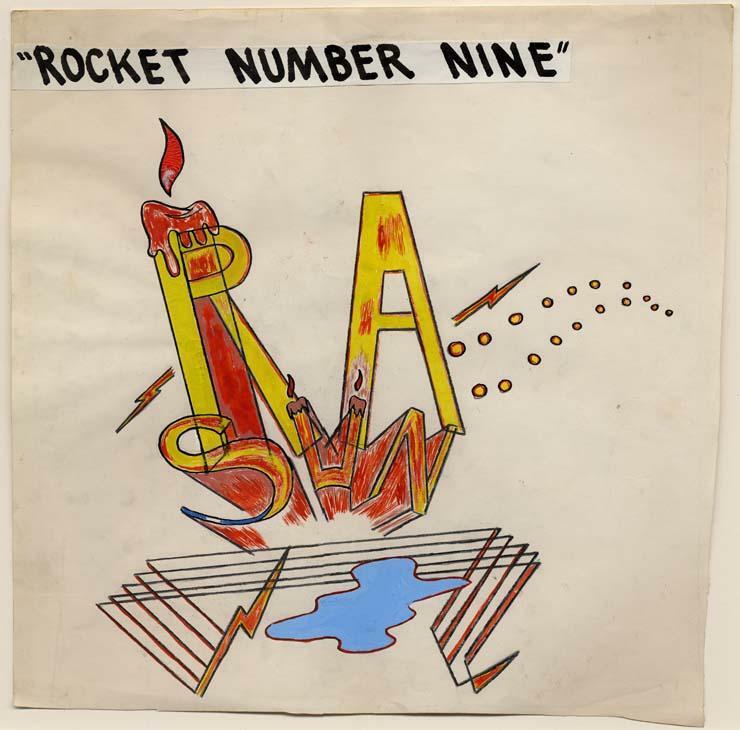 The exhibit includes scores and poetry written by Sun Ra, as well as some of his highly controversial political and philosophical broadsides. 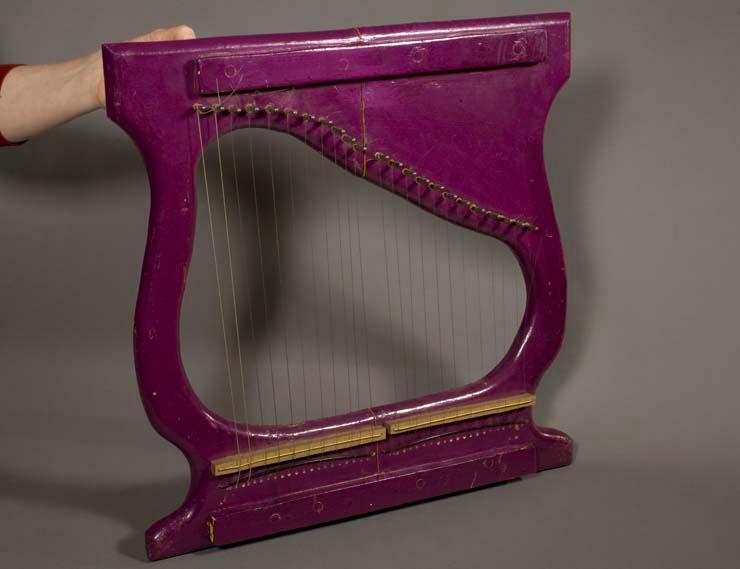 Sun Ra, Space Harp, wood, metal and wire, undated. One thing is certain: nothing about Sun Ra or his career could be considered "normal," even by the traditionally unconventional standards of jazz. He recorded an astounding number of albums -- some sources put the number at nearly 200. 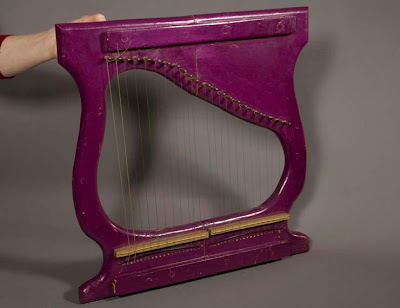 As early as the '50s, Ra was adding odd, often self-made instruments into the Arkestra's sound, like zithers, bells, gongs, chimes, and claves along with new creations he dubbed "the solar drum," "the space harp," and "the boom bam." He also had the Arkestra wearing outlandish costumes, including helmets with flashing lights and propellers. Some of these early costumes were cast-offs from a Chicago opera company. Jerry Gordon, who co-owns Evidence Music, which has re-issued twenty early Sun Ra albums on CD, remembers being overwhelmed by the first Sun Ra show he saw in the early 70s. "It was an incredible concert," he says. "It was music like I had never heard before. Ra and the dancers were wearing capes. Fans on the floor blew the capes so they looked like multicolored wings. They had a spiral light on [tenor saxophonist] John Gilmore during his solos that created a tunnel effect. Ra was also using lights to make it look like he was sticking his head in a black hole in space. It was just unbelievable. I considered it holy music, music people should hear." A Tonal View of Times Tomorrow, 1960[?]. Sounds from Tomorrow’s World notes that by the time he left Chicago in 1961, "Sun Ra was well on his way in a career as and a composer and arranger of some of the most avant-garde jazz of all time. He was also the architect of a philosophy that informed his music, his life, and the lives of those around him: a synthesis of Black Nationalism, Egyptology, futurism, occultism and Southern Baptist preaching." 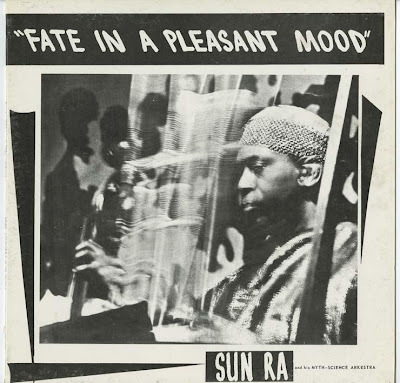 Jerry Gordon sums it up this way, "People loved to question Sun Ra about being born on Saturn, but these things were said to bring people out of their normal, humdrum, everyday reality. It's not about whether he's telling the truth. He tried to express his vision and get people out of the shadow world with his music. He was an educator and philosopher who tried to enlighten people."